Last Thursday, Girls Justice League tabled at the Beyond Zero Tolerance: A Community Symposium, presented by the School Discipline Advocacy Service at Temple University Beasley School of Law. Panelists and community organizations included Philadelphia Student Union, Galaei, and the ACLU of PA. It focused on a variety of experiences, but panelists specialized in areas such as disability law, legislative lobbying, academic writing, teaching in a Philadelphia Public Alternative School, and a Central High School student. They all added a range of comments and helpful insight about the state of zero tolerance policies in schools today. One thing that rarely made its way into the conversation was gender. One panelist spoke on the policing of femme bodies (particularly those of color) in school, but most of the panel spoke about more general numbers and highlighted racial disparities. Part of the problem is that few statistics are collected on gender and race, making it hard to assert hard evidence and facts about how it impacts girls, femmes, and gender nonconforming youth. According to National Women’s Law Center, “Black girls are six times more likely to be expelled than white girls.” This is a clear example of the relationship between race, gender, and education. However, it is often overlooked in issues such as school discipline because boys of color are perceived to be the most at risk, when really ignoring the reality femmes face only exacerbates the issue. Overall, the panel was an informative and thought provoking experience. In the future, GJL hopes to continue working to make education more equitable and accessible for girls and femmes by using the knowledge gained at this panel and carrying out gender-justice lens to implement solutions learned. Girls Justice League attended the March for Our Lives, a student led protest calling for stricter gun laws, on March 24, 2018. The protest was sparked after a gunman entered Marjory Stoneman Douglas, taking the lives of 17 people. The survivors of this horrendous act have gained nationwide media attention after calling for political action from elected officials. The issue of gun control has sparked a huge debate across multiple platforms. The face of movement, predominantly white upper-middle class students, has greatly influenced the media attention they have received. Communities of color, particularly African American and low-income neighborhoods, have been fighting for more intersectional, realistic, and comprehensive restrictions for decades. Gun violence facing communities of color has not gained nearly the same recognition as those of Parkland, Florida; this is not a color blind issue. What does GJL mean to our girls? During our February 24th Saturday Institute, we asked the girls: "What does GJL mean to you?" Here are the responses! What does intersectional justice mean to you? Tell us in the comments! 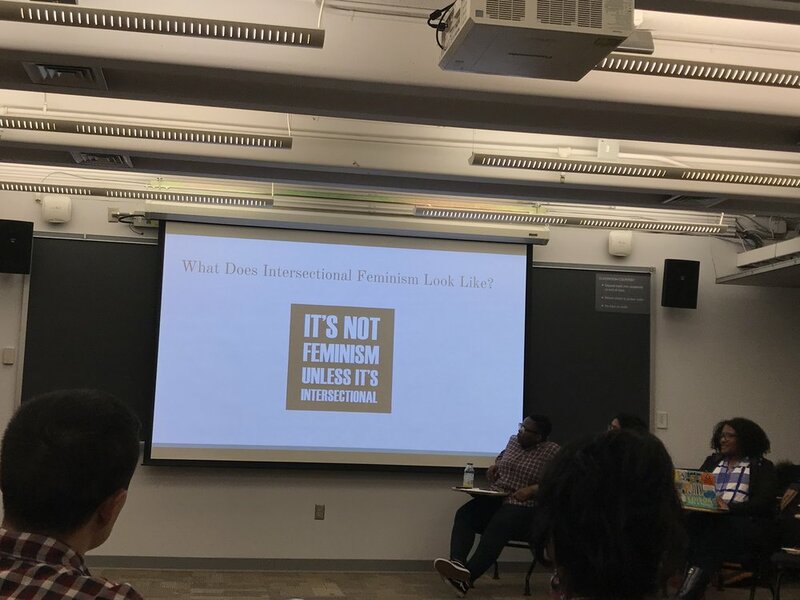 On Friday 23, 2018, the executive Director of Girls Justice League, Charlotte Jacobs, with the help of some of our members, facilitated a workshop called “#SayHerName & The Fight for Intersectional Feminism” at The Graduate School of Education, located on University of Pennsylvania’s campus. The purpose of this workshop was to stress the importance of inclusion of not only white women in the fight for equality, but women of color, disabled women, trans women, poor women, women of different religious backgrounds, and all women and femmes without regard to race, ethnicity, sexual orientation, and anything in between. #Sayhername was broken down into 6 segments, first community agreements, next key terms related to intersectional feminism, followed by an introduction to the #sayhername movement, then a discussion on what different types of feminism has looked like throughout history, and finally it concluded with a discussion surrounding what people can do everyday as acts of resistance. The girls elaborated that without intersectional feminism, people are forced to choose one aspect of their identity and prioritize that. This can lead to problematic movements that leave out underrepresented groups, such as the women’s suffrage movement of the early 1900’s, the feminist movement 1970’s, the #MeToo movement, and Barack Obama’s grant making initiative My Brother’s Keeper, which excluded girls, trans, and gender non conforming youth. All of these are NOT examples of intersectional feminism and further harm marginalized groups because their voices are silenced and their stories are erased. As a reaction to the lack of awareness for the police brutality faced by black women and gender nonconforming folks, Kimberlé Crenshaw created the #Sayhername movement. It’s designed to lift up the names of trans women of color. This is an example of an intersectional movement because it focused on both racial identity and gender and the ways in which those factors interact with each other. In 2018, Girls Justice League is hoping to continue to grow even more intersectional by becoming clearer in our mission, better supporting disabled and neurodivergent girls and femmes, and further develop organizational missions surrounding sexual orientation and non-femme gender identities. GJL looks forward to a year full of growth and action. We invite you to participate in our Saturday and Summer Institute’s. Information regarding the Summer Institute application process will be available soon. On October 30th, 2017, I was able to attend a congressional briefing on Maternal Mortality and Reproductive Health, which was held at the U.S Capitol Building's Visitor's Center in Washington, D.C. I was able to attend along with Erin Aja Grant, who is the Board Co-Chair of the Abortion Care Network. Being my first time in D.C, it was a memorable experience to listen to a panel of extraordinary women of color share research and testimonies on maternal mortality and reproductive health. I was very unaware of the maternal mortality rate in the United States. You would think that in a country as developed as ours, we wouldn’t have such problems. It is actually a lot safer to have children in Kenya and Bosnia then it actually is in the United States. Charles Johnson was a special guest on the panel, and told the story of his beautiful, vibrant, and exceptionally healthy wife who passed after she gave birth. She began hemorrhaging, and the hospital took way too long to attend to her, and she died an unjust death. There were many prolific speakers at the event, and one that particularly amazed me was Bethany Van Kampen, who is a Policy Analyst at the National Latina Institute for Reproductive Health. What I enjoyed so much about their presentation was how they explained the long and complicated route it takes for someone to have an abortion. She spoke about the 17-year-old "Jane Doe", an undocumented immigrant who was trying to get an abortion in Texas, perhaps the most deadly state to have an abortion. When Jane sought out to have an abortion, she was held in federal custody. Although she had received an order that she was allowed to have an abortion, federal officials refused to allow the procedure to happen. Jane was successfully able to have her abortion in late October. This congressional briefing was an eye-opening experience, and it is nice and heartwarming to know that there are congresspeople such as Robin Kelly (IL-02) and caucuses such as the Congressional Black Caucus Health Brain Trust and organizations such as the Reproductive Justice Initiative that want to talk about this topic that is seldom talked about. Our future can only be successful if we better the lives of women. With how they are being treated now, with complete disregard, the future is dark. We need mothers to be able to come home with their children and to raise the next generation, but we also need to let women have autonomy over their own bodies and their life choices. As a GJL girl, I'm hoping we can have much more discussion about maternal mortality and reproductive rights, especially in regards to our reproductive health project. The Girls Justice League attends the 2017 Pennsylvania Conference for Women! Last week, a few of our girls attended the Young Women's Program that was a part of the 2017 Pennsylvania Conference for Women. As a part of the conference, the girls attended workshops focusing on finding your passion, and health & fitness. They also sampled treats, grabbed some swag at the Exhibit Hall, and talked with local business owners and activists. But hands down, the best part of the conference was getting to see their sheroes former-FLOTUS Michelle Obama and Producer/Screenwriter/Author Shonda Rhimes! All smiles before the conference! Former First Lady Michelle Obama & Shonda Rhimes provided advice, laughs, and truths that we will not soon forget! The GJL 2017 Summer Justice Institute Begins! This summer we have 16 Summer Justice Fellows who have joined us for the Summer Justice Institute, whose theme follows up on our Turning Points conference, "Escaping the Systems: Fighting for the Rights, Justice and Liberation of Girls." Led by an awesome leadership team of veteran GJL girls and community activists and organizers, the Justice Fellows will engage in an eight-day series of workshops, activities, and direct actions focusing on reproductive justice, the justice system, education justice, and food justice. Check out our page on Instagram (@girlsjusticeleague) to see more of what we've been up to this week! The Girls Justice League Welcomes its First Executive Director! The Girls Justice League is a girls’ rights non-profit organization dedicated to taking action for social, educational, and economic justice for girls, young women, and all those who identify as female in Philadelphia. Congratulations to our 2017 GJL Grads! Congrats to our 2017 GJL Grads, Shaniyah, Sarah, & Nyja (and Tymiah, Casey, & Elly)! We can't wait to see what great things you do in the future! The Girls Justice League 2017 Summer Institute is Coming Soon! The GJL 2017 Summer Institute will take place July 7-15, 2017! If you are a person who identifies as a girl, are between the ages of 13-19, and are interested in social justice and gender justice issues, then click here to apply! The deadline for applications is Wednesday, May 31st. 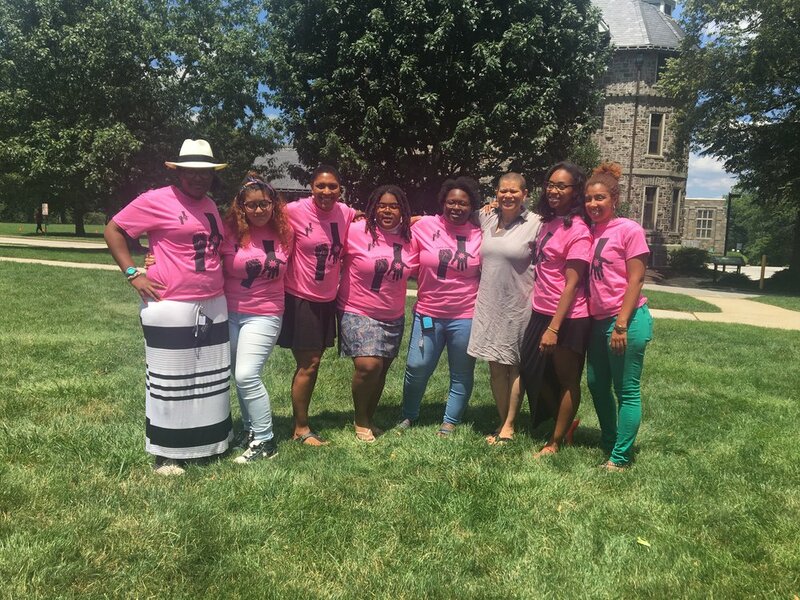 GJL Girls Reflect on our 2nd Annual Turning Points Conference! Desar'e and Melanie presented a workshop on "Good Girls and Bad Girls" at the Penn Summit on Black Girls and Women in Education on May 2, 2015. They asked the participants, who were mostly women, to stand up if the statement Desar'e and Melanie read applied to them such as "Stand up if your racial identity led people to doubt your ability". They learned that the problems that girls are facing now have been longstanding issues that generations of women have faced. The participants also had the opportunity to share their stories in a safe space of supportive girls and women. Many participants shared that this workshop was one of the rare experiences where they could share their story and truly be understood. Also, check out an article in The Atlantic magazine (http://www.theatlantic.com/education/archive/2015/05/black-girls-should-matter-too/392879/) where GJL member Melanie is quoted about her experiences in school!